With every passing week both these teams know they are running out of time. While the Jaguars have two more wins than the Cowboys, they have had their fair share of struggles so far this season. The Cowboys are looking to right their ship and it is going to be a lot harder with the loss of Pro Bowl quarterback Tony Romo. The Jaguars have had some good games and some really bad games. At times they have looked like a team that many people underestimated and at others they have looked worse than we though they would be. The Jags have struggled in scoring, and stopping other teams from doing so. They are losing by an average of 24.8 pts/game and are having a hard time scoring points, only averaging 18.2 pts/game. The Cowboys have been ugly this season. When they have played well they have shot themselves in the foot and when they have kept the mistakes to a minimum, they haven’t had the strongest of efforts. Last weeks performance was not very good, though the score made the game look close it wasn’t. The Boys need to win to keep the last sliver of hope alive for themselves. While the rest of the world and fan base now believes their season is pretty much over, Wade Phillips and crew continue to preach the “one game at a time” and “the season’s not over” message. The Jags have struggled with injuries this season and will be getting QB David Garrard back from a concussion he suffered two weeks ago when they got embarrassed by the Titans (30-3) on Monday night. Garrard bring the Jags some mobility at the position. He has a good arm and will look to use that to stretch a Dallas defense that is having problems with the deep ball. The real stud of the Jaguars offense in tailback Maurice Jones-Drew (MJD). Jones-Drew is having another solid season, not spectacular, but solid. MJD is averaging only 3.8 yards/carry which is low for him. While he only has one rushing touchdown this season, he is a threat to go all the way any time he touches the ball. The other standout for the Jags offense is WR Mike Sims-Walker. Sims-Walker has had a disappointing season so far, but he is big and fast and presents the Cowboys a tough matchup. Dallas has struggled with physical receivers this year (Steve Smith NYG, Kenny Britt), so the Jaguars are going to look to exploit that. Look for the Jags to pound the ball with MJD and then look to play-action deep passes to the “lawfirm” Mike Sims-Walker. The real struggle for the Jaguars has been on defense. The Jags are ranked 30th in overall defense, giving up a whopping 382.1 yards/game. The also cannot keep teams out of the end zone with 29.9 points/game allowed. The real problem is they cannot get to the quarterback. The Jags have only 12 sacks in 7 games this season. The Jaguars won’t have to worry about any scrambling by the Cowboys with Jon Kitna taking the snaps, but Kitna does have a great arm and will test the secondary of the Jags if he has time to throw. 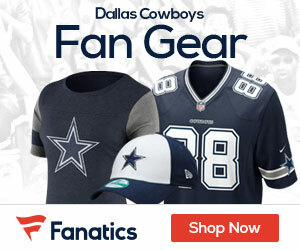 Dallas had a pathetic offensive performance last week against the Giants. They had only 41 yards on 13 carries between Jones and Barber. The Boys also had a string of six straight three-and-outs. The Cowboys will need to get better offensive line play if they have any shot to win this game. Kitna was sacked three times last week and the Boys could not run the ball at all. While the Jags don’t have a great defense like New York, it has not seemed to matter who the Cowboys have played this season, their offense has been limited. 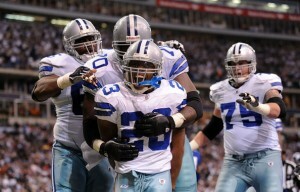 The Cowboys will want to establish a running game early to keep pressure off of Kitna. When QB Tony Romo went down last week, you could feel the air rush out of this team. Hopefully, a short week of work has gotten the team a little more inspired and hungry. On defense the Cowboys need to get to Garrard. If he has time to throw the ball, he will pick apart the defense. If you can get pressure on him, he has proven that he will turn the ball over and make bad decisions. The Cowboys also need to be aware of his scrambling ability. Garrard does not do it often, but he can be an effective runner. The only way the Cowboys will have a chance to get to Garrard will be if they shut down the run game. While that was an emphasis last week, the Giants’ Amhad Bradshaw ran wild over the Cowboys defense and gave the Giants great down and distance situations. If the Cowboys can force the Jags to be one dimensional they will have no problem winning the game, that of course is a big “if”. 1. WR Dez Bryant – When Kitna came into the game on Monday night, Bryant became his main target. Watch for Bryant to have another great game out of the slot for the Cowboys. 2. WR Mike Sims-Walker – While he has been quiet all year so far, the Cowboys seem to bring the best out of opposing wideouts. Sims-Walker could be in for a breakout game. 3. Special Teams – The Cowboys look like they have fixed their special teams problems, but another week of evidence would be nice. 4. Jon Kitna – The Cowboys can only win if he doesn’t lose the game for them. Kitna has thrown a career 151 touchdowns to 154 interceptions. The Cowboys need him to protect the ball and get it into the hands of the guys that make plays.